FAQ: What options are available for home-use drinking water storage? Rainwater harvesting tanks are an excellent way to store and collect rainwater for use as a drinking water supply. See steel and collapsible tank options for this type of storage. Question: I'm looking to see what types, sizes, and prices for secondary drinking water storage for urban use in my garage in case of public water interruptions. I would do well to consider the stress weight on the concrete flooring and spread the weight. My garage is 20 x 20 and I need it to store other important things, too. Would a bladder take up too much floor space? Answer: Thank you for your inquiry. We would be happy to help. Portable Tanks, a division of GEI Works, offers a range of different tanks that you might be able to use for this type of storage. 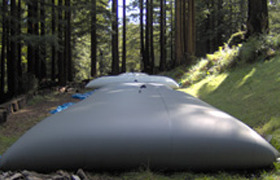 Our Collapsible Rainwater Harvesting Tanks is much more economical and collapses for easy storage. If space is an issue when it is filled, the tank could be stored just outside of your garage on a ground cloth to protect it from abrasion and puncture. If you are concerned about the stress weight, it will be helpful to consider the amount of water your are looking to store. This weight can help determine whether or not this type of storage would be a good idea for your garage area. The collapsible tanks are typically wide and low profile, allowing them to distribute weight over a larger area rather than confining it only to a certain location. One of the best advantages for these tanks is their low profile. This allows them to be stored in various conditions. If you are additionally concerned about the storage tank being able to fit your location, you can also provide us with the specifications required and we can work to fit this size. Tanks are often custom built to meet different storage requirements.